Josef Bohuslav Foerster (1859-1951) is one of those unlucky composers, who despite a very fruitful and active career, and an extremely long life, still hover on the very fringes of the whole musical establishment. A highly educated man, he was a master of his métier, also being drawn towards literature and printing, apart from being a prolific writer for German and Czech language newspapers. He was also a diligent teacher and Mahler's confidant and loyal counsel. 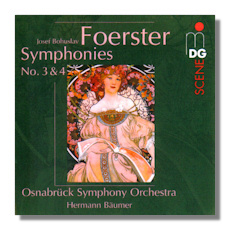 Unfortunately, Foerster's fame as a composer suffered as a result of the Mahler connection and his music still languishes in almost total neglect. Apart from his 4th symphony, "Easter Eve" and a couple of other orchestral works, his other output hardly gets a look-in on the concert platform, so this MD&G issue, coupled with that of the 1st and 2nd symphonies (MDG6321491-2) is of the utmost importance to the Foerster cause, this year being also the 150th from his birth. The Third was written in 1894, at the beginning of his stay in Hamburg, and although the piece is basically intimate and inward looking, its many hidden subtleties are wrapped up in a massive brass structure. The symphony also contains a wide range of moods; from the humorous to the dramatic; from a songful tenderness to a despairing loneliness. The 4th dates from 1904 and Foerster started its composition precisely on Good Friday of that same year. The work evokes the Saviour's walk to Calvary, the seasonal Spring breezes, primroses and shepherd's song, a sorrowful yet magical prayer and the glory of the Risen Christ together with the joy of this momentous event. A masterly "darkness to light" journey filled with moments of outstanding musical beauty. Baumer and his German counterparts perform magnificently; their vivid accounts do full justice to this quite exceptional music. Excellent notes and sound complete an inspiring addition to the still all too lean Foerster discography.